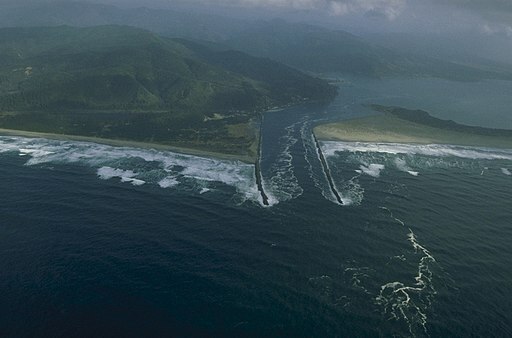 The south jetty of Tillamook Bay does not see very many SCUBA divers because of the difficulty of access. The road out to the jetty is almost always gated and locked. 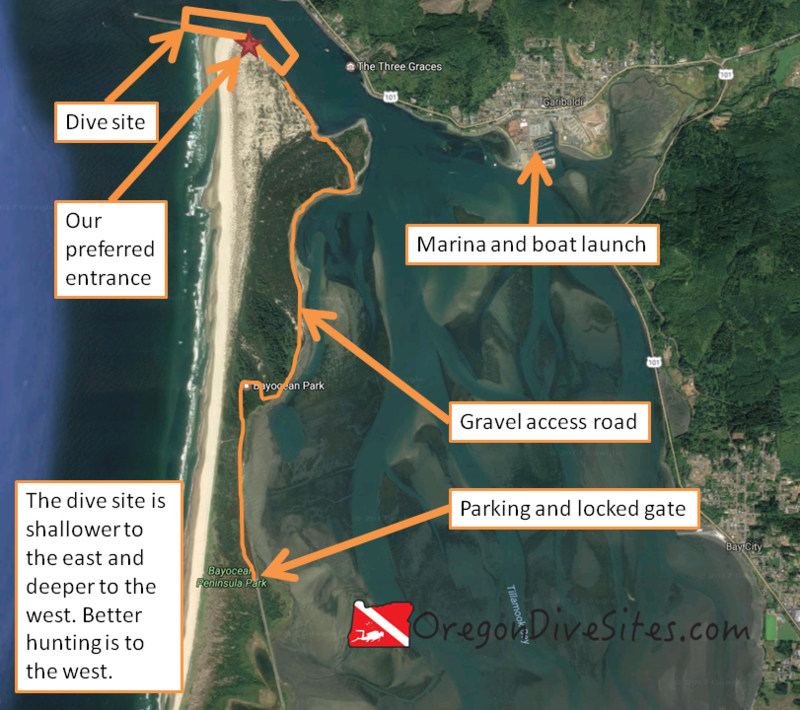 With a boat launched from one of the marinas in Tillamook Bay, you can easily reach the site. We have heard of a few people surface swimming from the north shore at the Inner North Jetty dive site but that is an epic surface swim where you have to fight the current and dodge boat traffic. With a hand cart and patience, you can lug all of your dive gear from the parking area along the gravel road to the jetty a few miles away. The main reason people go dive the south jetty is to spearfish. Because so few people dive along the jetty, the fish tend to be bigger and more plentiful than on the north jetty (at least in our experience). You also get to put the feather in your SCUBA cap of diving a site that not many people ever get to dive. By Bill Johnson, U.S. Army Corps of Engineers [Public domain], via Wikimedia Commons. The south jetty (on the right) doesn’t get many SCUBA visitors but it is worth the difficulty of accessing the dive site if you want do some good spearfishing. The old abandoned town of Bayocean is what drove the construction of the jetties on the mouth of Tillamook Bay. Depending on what path or road you take through the Tillamook County Bayocean Peninsula Park, you might catch a glimpse of a few foundations and the memorial sign at the old town square. Most of the town fell into the ocean due to coastal erosion. See page for author [Public domain], via Wikimedia Commons. The old natatorium and dance hall at Bayocean before they fell into the sea. The reason anyone dives here is for the spearfishing. Otherwise this is a pretty typical Oregon jetty dive that has really difficult access. The little unincorporated town of Barview is across the channel. The town of Garibaldi is just up the bay and on the other side. Tillamook is further south. If you’re going to access this site via boat, go to Garibaldi and put your boat in at the marina there. If you’re going to do the long hike to the dive site, in Tillamook take the Netarts Highway to the west from downtown and then turn onto Bayocean Road just after you cross over the bridge. Follow Bayocean Road all the way to the parking area at the Tillamook County Bayocean Peninsula Park. If you’re going to do the surface swim because you’re practicing for an Iron Man or because you like punishing yourself, the parking area for the Inner North Jetty dive site is the best place to park. In Garibaldi at the boat launch, there is plenty of parking. At the Bayocean Peninsula Park parking lot, there usually is plenty of parking. It is a challenge to get to the south jetty on the Tillamook Bay but the spear fishing is good. The site hugs the jetty wall from southeast to northwest on the inner part and then after a bend in the jetty, from east to west. The western area is deeper than the eastern area. You could theoretically dive the jetty tip if you wanted but the conditions out there are almost always very rough and not something that would be all that fun to do. The south jetty on the Tillamook Bay is a good place to spearfish. There is one area on the jetty wall that is easier to climb over than others but most of the jetty is pretty accessible. There is one area on the jetty wall near where the jetty hooks to the west that is a little lower and easier to scramble over. However, you can enter or exit just about anywhere along the wall. The south jetty can be done either as a shore dive or a boat dive. A boat dive is significantly less physically demanding although a competent captain is needed to navigate dropping off SCUBA divers along the jetty wall. If you do this as a shore dive, prepare for a several mile long hike towing a cart with all of your gear in it. This site almost always has a wicked ripping current along the south jetty. The tidal exchange into and out of Tillamook Bay is pretty huge and there is very little slack tide. Stay close to the jetty rocks and plan your dive to stay safe. You don’t want to get sucked out to sea or pushed way up into the bay. There can be surf and surge, especially the farther out you go on the jetty toward the ocean. We strongly suggest you assess the conditions and only dive where you feel comfortable diving. Viz here is usually around 15 feet although it can be better in fair weather. The bottom is mostly sand so you don’t need to worry too much about stirring up mud. Water temperature usually is around 42-55F. The best time of the year to dive here depends on if you are doing the long walk from the parking area or if you are taking a boat. If you’re taking a boat, just about any time is decent to dive here as long as conditions aren’t too rough. If you’re hiking, we suggest doing it in the fall or spring when it isn’t too sunny or warm so that you don’t roast on the long slog to the dive site. On the westerly part of the jetty, you can find 40 feet sometimes. On the inside eastern part of the south jetty, the depth is more like 15-20 feet. 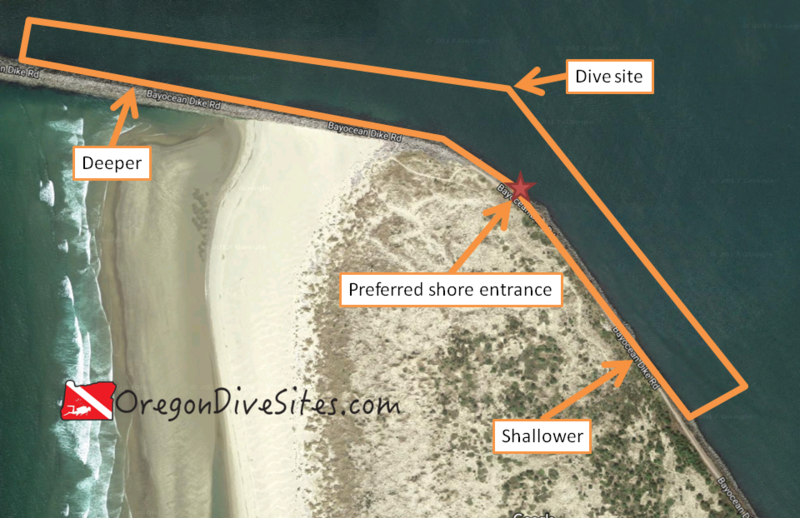 We suggest having advanced open water training and experience diving other jetties in Oregon, such as the Florence north jetty SCUBA park and “crab hole” where there is an easy entrance and exit and more forgiving conditions. If you are doing this as a boat dive, you need experience on how to safely enter and exit a boat. If you’re planning to go more toward the jetty tip, rescue diver training, drift diver training, and a lot of experience in very rough conditions is necessary. The dive itself is an intermediate difficulty site because of the jetty entrance and exit, and the current. However, the huge hike from the parking area makes this a shore dive for only the most fit of people. If you’re doing this from a boat, weekend warriors shouldn’t have much issue. If you do the long walk from the parking area, you have several miles to lug all your gear. A wheeled cart will make your life much easier. There isn’t any need to surface swim unless you are accessing this site from the inner north jetty dive site. If that’s the case, then you are looking at a 1000 foot surface swim with current and shipping traffic to dodge. We suggest you contact the Tillamook County Parks Department to see if you can arrange to have the gate opened to drive out to the jetty rather than having to walk. We have not been successful with this approach yet but if enough people start asking, perhaps the parks department will start opening up the gate more often for SCUBA divers. There used to be a shop in Tillamook that did air fills although we can’t confirm if it is still open. Please let us know if you know of a local shop! Tillamook has a lot of good food. Oceanside and Netarts just down the road have good food as well. If you’re coming in from Garibaldi on a boat, there are also some restaurants there. There aren’t any close campgrounds although Tillamook County Parks operate several in the area as does Oregon State Parks. We have not tried any of the local hotels. Please let us know if you have tried one and found it to be diver friendly!